Sure, sure. Yes, Ghostbusters High. The Ghostbusters as teenagers, having fun teen adventures busting ghosts that they never recalled nor discussed as adults—formative experiences with the paranormal that somehow did not factor into their later lives as established by the movie, or something. Or, you know, maybe it’s all-new kids who are inspired by the Ghostbusters to obtain their own crude nuclear accelerators, so they get in on the action, and maybe Dan Aykroyd drops by. Like Stranger Things, but also Dan Aykroyd gets paid. Absolutely. Yes. Of course. We have learned by now that Dan Aykroyd will say yes to literally any Ghostbusters idea you put in front of him. A Ghostbusters sequel, but without Bill Murray and everyone else is old and frail as a depressing reminder of your own encroaching mortality? Yes. Or a Ghostbusters sequel where they train a new generation of hip Ghostbusters? Absolutely; let’s get Ashton Kutcher. An all-female Ghostbusters reboot that, somewhat confusingly, exists parallel to the original? Sure sure, although Dan Aykroyd reserves the right to retroactively criticize it for not staying true to the original Ghostbusters vision, whatever that is by now. Look, there’s no faulting the man: He created one of the great franchises of modern cinema, and however much its success might be attributed to the unique, unreproducible comic chemistry of its stars in that specific time and place, it’s understandable that he would want to extend it. As someone who’s likely watched Ghostbusters upwards of 100 times in his life, I get the impulse to want to repeat the experience, to return to that world over and over again. However much I might wish he would leave well enough alone, I get it. But we can stop asking. 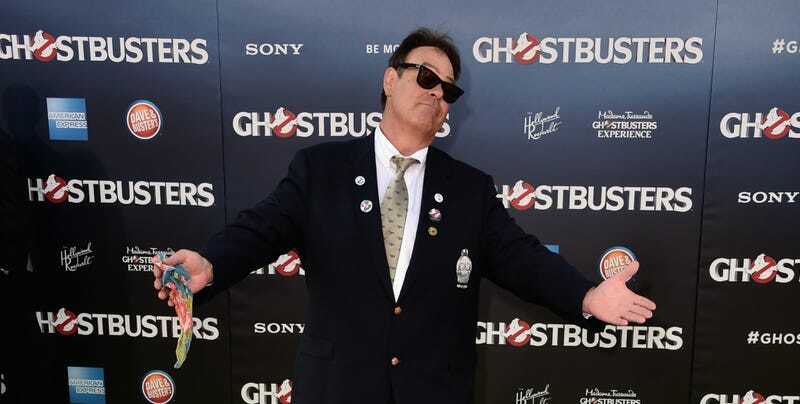 Cinema Blend’s quote, after all, hailed from a party at a shoe store, one promoting a new line of limited-edition Reeboks modeled after the self-made Ghostbusters hi-tops sported in Stranger Things—a shoe party that, let us keep in mind, Aykroyd actually attended. It seems that if you say the word Ghostbusters, rest assured that Dan Aykroyd will magically appear to discuss franchise opportunities. And you can append the word Ghostbusters to anything and he will take it under serious consideration before immediately agreeing: Ghostbusters… in space, busting alien ghosts. Ghostbusters… on the beach, busting bikini ghosts. Ghostbusters… on a soul-searching trip through Napa Valley wine country, busting the ghosts of past relationships. Ghostbusters… in Bill Murray’s office, refusing to leave until he just agrees to put an end to this. It will haunt us until the end of Dan Aykroyd’s days; this ghost will never be busted. Let’s all just assume from here on out that Dan Aykroyd is “up” for it, whatever it is.